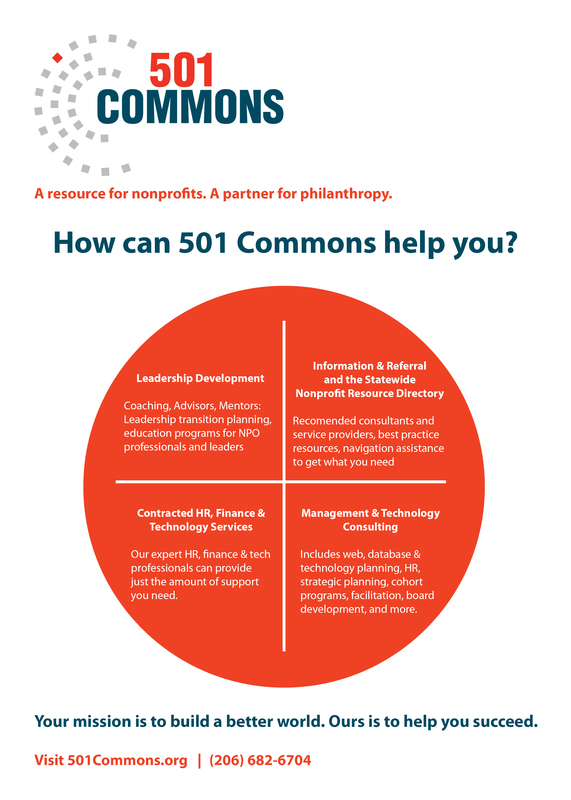 Sign up to receive the Nonprofit Nexus - timely information on nonprofit resources, news, and opportunities. Learn about our popular Board Training in King County series designed specifically for board members, prospective board members, and executives. Sign up to receive email notifications about upcoming workshops. Take the James Street exit (165A) and turn left on James. Continue east on James and turn right on Boren Avenue. Then, turn right on 12th Avenue. Continue on 12th over the Jose Rizal Bridge to Pacific Tower. Head east over the West Seattle Bridge/Spokane Street. Take ramp to Columbian Way S. toward Columbian Way/15th Ave S. (East). Turn left at the first light onto S. Spokane Street. Turn left again at next light (one small block) onto 15th Avenue South. Continue north until you reach Pacific Tower. Guest parking is available on levels P2 and P6 in the West Garage, which can be accessed from the driveway with the flag circle which you enter off of 14th Avenue on the south side of the tower. Guests purchase a ticket upon arriving and pay whatever amount they owe before leaving with a credit or debit card. Prices are subject to change. Additional parking for $6 for 10 hours is available in the north parking lot, which is accessible from 12th Avenue. There is one pay station at the entrance to that lot. ADA parking is located in the north lot (enter building through north entrance), the P1 level in the West Garage, and as you enter on 14th Ave, around the flag circle in front of the south main entrance. Street parking is also available. For parking after hours (after 6 p.m.), please call Pacific Tower’s security number at (206) 255-3974. It is important that you park in the red brick parking garage to the WEST of the tower which you access by turning off of 14th into the driveway on the south side of the building. Drive past the Pacific Medical Clinic Garage and the flag circle to the West garage. Our offices are located on the 11th floor. Reception is to the East as you get off of the elevator. Many of our meetings and events are held on the 8th floor - please check your event details. Call Bryan at (206) 682-6704 x119 if you need assistance. Note: 501 Commons' Help Desk, including Emergency Support, will not be available on the above closure days. In addition to the dates listed above, 501 Commons may have an unexpected closure due to inclement weather, severe power outages, or other emergencies. Check our blog for the most up-to-date information regarding weather-related office closures.